A lovely necklace of big copper/bronze colored freshwater pearls & gold filled roundels with swarosvski crystal accents. Each pearl is separated with a tiny gold-filled beads. 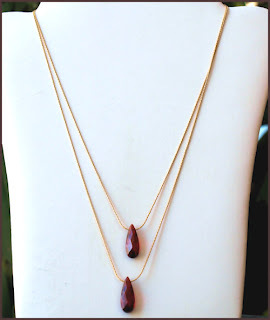 2 beautiful tear-drop shaped ruby cubic zirconia delicately hang from a thin gold-filled chain. as hell and won't spend alot for jewelry why should I expect you to! Well that's all for now but I'll have more soon!